ZLP 1018 [LP] Arranged from two separate Menuets (in reverse order, here the first in g minor and the second in G major) from Nouvelles suites de pièces de clavecin, Suite in G major, c.1727; the arranger is unknown. Schubert / unidentified arranger Waltzes (medley) 1946/04/19 XCO 36130 For the contents, see below the table under "Work". Sorting the table can be helpful for certain purposes. Clicking on any column header (the lower grey part, not the top heading that groups the columns) will sort the table rows on that column in ascending order; blanks cells are sorted in last position. Clicking again on the same header will change the sort order to descending; a small arrow appears in the header to indicate the current sort order. Clicking on further columns will re-sort the table, maintaining the order of the previously sorted items as subsets within the new sort order. The initial order results from sorting the items by composer and within that order by date, for which one clicks first the header for date and then composer. The initial order can also be recovered by clicking on your browser's refresh button. 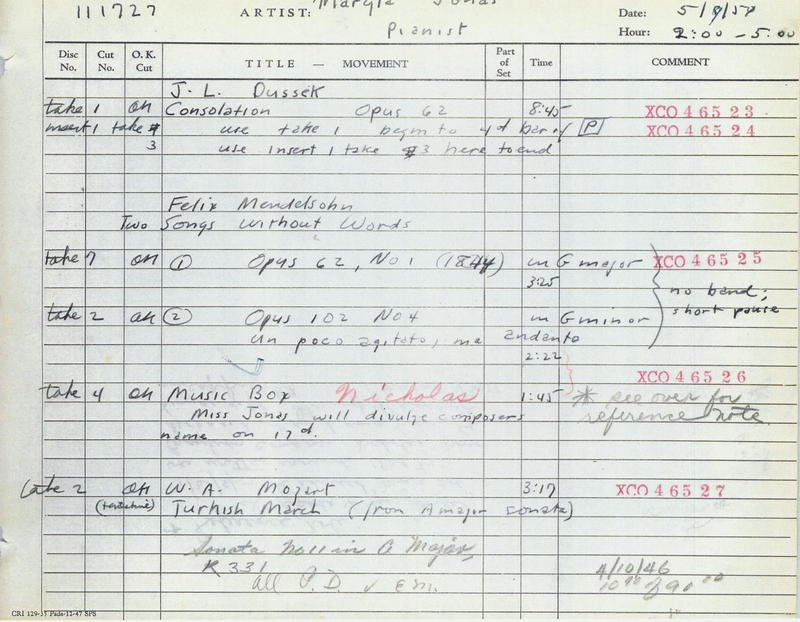 Composer: Note the errors in the documentation accompanying the recordings as released for composers Nicholas -> Villa-Lobos (attrib. ), Rossi -> Rameau, and Michelangelo Rossi --> Lorenzo de Rossi — see below under Errors. Work: Upper-case letters indicate major keys, lower-case letters minor. D779 No. 27 in Eb (part 1 repeated, part 2 the last 8 bars only repeated). The source of this medley is not known to me; clues may be found in the variant text used, e.g. in D365/2 bar 13 first note a tone higher, which appears in, for instance, Czerny's version seen in Maurice Brown, Essays on Schubert , Macmillan 1966 p.301. The mordent on the first note may also provide a clue. Dreadful inaccuracies occurred in Jonas's playing of the last few bars of D365 No. 21, a possible reason why this item was not used in LP compilations. "She [Maryla Jonas] told me that she liked to collect and play little miniature "music-box" pieces, many of which were composed especially for her by such friends as the brothers Edward and Viktor Labunski." Incipit: These are provided to help avoid errors of indentification, especially the frequent confusion of the Rossi Andantino with the Rameau Minuet and Trio. Date: The date of recording is intended, rather than the date of issue. Matrix: A matrix number identifies one side, typically of a 78 rpm recording. When a matrix number ends with a hyphen followed by a number, the latter number indicates the take in the given session. Comments: These are of various kinds. Timings can only be approximate. For CDs, the timing printed in the CD's documentation sometimes does not match that indicated by a playing device. For CDs the timing includes any silence on the track before and after the playing. Tracks are shown as B3 for track 3 of side B.
Columbia: US releases. The prefix in some cases could be M or MM (= Modern Music); see for instance http://www.78rpmcommunity.com/colmasterworks/introduction.html . Columbia: 12": ML 4476 ("A Piano Recital of Chopin"), ML 4624 ("Maryla Jonas plays Piano Miniatures"). 10": ML 2004 ("Piano Music of Chopin") (issued in 1948), ML 2036 ("Chopin Mazurkas"), ML 2101 ("Chopin Mazurkas"), ML 2143 ("Chopin Nocturnes"). 7": 3-228 (ZLP 1018, 1019) (this is 33 rpm but not flexible). The LPs ML2004, ML2036 and ML2101 have corresponding 78s. The LPs ML2143, ML4476 and ML4624 do not have corresponding 78s. The single exception is the Handel Passacaglia: the same performance was issued as a 78 and also as an LP, even though not transferred from the 78. The "Rossi" (actually Rameau) item was also dubbed to LP quality but has not yet been released other than on the rare 7" LP; I am therefore making it available on this website (see the Other column). The 7" LP ZLP 3-228 provides LP sound, not 78 sound. According to the Producer's note in the Pearl booklet, all the recordings were made onto acetates; the acetates could then be dubbed to 78 or to LP or to both. Another 12" LP, not shown in the table, is Columbia Entré RL 6624 Green label ("Chopin Mazurkas"), which combines the complete contents of ML 2101 and ML 2036. Another 12" LP, not shown in the table, is Columbia Masterworks Preview XLP 12723 (Preview Kit No. 14, 1253), which includes one work played by Maryla Jonas, the Dussek "La Consolation" from ML 4624. Sony: The Maryla Jonas Story: her complete piano recordings remastered , Sony Classical 88985391782. Released 2 August 2017. "Newly transferred from the original analogue discs and tape masters using state-of-the-art 24 bit / 192 kHz technology". St-Laurent: Maryla Jonas Vol. 1: The 78 rpm recordings YSL 78-219 (2 CDs); Vol. 2: The lp records YSL 78-223 (2 CDs). Released c2015. In this discography the CDs are numbered 1, 2, 3, 4 for Vol.1 CD1, Vol.1 CD2, Vol.2 CD1, Vol.2 CD2. Andante2: Chopin — Solo Piano , Andante AND AN1190, disc 2 of 4, released 22 March 2005. The two Nocturnes also appear on A Chopin Program from the Andante Collection , tracks 8-9. WAP1: Women at the Piano , Volume 1, Naxos 8.111120, released 2006. This website: See under Columbia above. Rows may be sorted (see Sorting). Pearl CD: "Rossi Andantino in C". St-Laurent CD: "Salamone Rossi (1570-1630) Andantino in C minor". 7-inch LP 3-228: "Rossi Andantino in C major". The correct identification of the item heard on the above releases is: Rameau Menuet and Trio (two Menuets) from Nouvelles suites de pièces de clavecin , Suite in G major (c.1727). Jonas has started with the second Menuet in g minor, then played the first Menuet in G major as a Trio, and then again the first Menuet da capo. Thus the two Rameau Menuets have been arranged to form a Menuet and Trio. The identity of the arranger is unknown to me. Thus the two items had been entered with the wrong matrix numbers originally, and then corrected by interchanging them. This error was propagated until Sony's release. It also meant that the Rameau Minuet and Trio was wrongly identified as the Rossi Andantino. The wrong keys given were additional independent errors, and St-Laurent indicated the wrong Rossi, out of several composers with that name. The correct music of the Rossi Andantino is now released for the first time by Sony, and the music previously thought to be by Rossi has been correctly identified as by Rameau. Ironically, Sony themselves made the same error on their p.42: "CD 4, Track 12 previously unreleased", whereas it is Track 11 that was previously unreleased. (2) A second error has been the occasional misidentification of the composer Nicholas as Villa-Lobos. This misidentification was made in 2017 by Christopher Howell, referring to the present website. Howell's very alert and certainly plausible deduction was further supported by the composer's name having been entered in hand-writing in the orignal Columbia documentation instead of the usual type-writing, according to p.41 of Sony's booklet, and the type-written Thomson crossed out with Nicholas written in by hand, according to p.25 of the booklet. However, further information has since come to light in original documentation kindly provided to me by Robert Russ of Sony: A record page of Columbia Records including Nicholas Music Box, and A reference note written on 30 July 1951 by Elizabeth Martone from the Copyright Department at Columbia Records, which is almost incontrovertible evidence that the composer's name was Nicholas. Therefore, through no fault of Howell's, his earlier deduction based on limited information now seems no longer correct. Even now, the composer's identity is not fully known: one might assume that "Nicholas" is the composer's first name and that Jonas had not known or had not remembered his surname; a search for a plausible surname has not so far borne fruit. (3) The Chopin Mazurkas op.41/2 and op.41/4 were so identified in all sources for these recordings until Sony adopted the alternative numbers op.41/1 and op.41/3 in their booklet p.33. The numbering of the Mazurkas within op.41 is in fact not standardised, and both numberings are acceptable, so although this may appear to be an error it turns out not to be one. (4) The author of the Rossi work appearing on Sony's CD 4 track 11 has been misidentified by Sony as Michelangelo Rossi, whereas it is certainly Lorenzo de Rossi. Interesting evidence is provided by the notes enclosed with the CD Tactus TC 681907 of an organ version, played by Marco Ghirotti. The work was composed for alternative keyboards: harpsichord or organ. A score of the Rossi work can be seen here and here, the latter kindly supplied by Robert Russ of Sony Classical International on 23 May 2018. Errors, gaps and question marks remain in the present discography. The help of readers in rectifying these will be greatly appreciated; for this purpose or to make other comments, please send email (via my home page). My reasons for attempting this discography were that (i) in connection with my research into her playing, I needed a discography of Maryla Jonas, as complete as could be managed and covering all media, and (ii) I did not know of the existence of such a discography. I am releasing it on the Internet in the hope that (a) it might be helpful to others, and (b) others might help to correct errors and provide additional information. Richard Green of the National Library of Canada, who kindly provided a transfer of a 78 held in the Library. Robert Russ of Sony Classical International, who provided information helpful for tracking down errors in documentation. Alexander Tsertsvadze, who has over many years helped me to keep the discography up-to-date. Kelvin Watson of Sydney, who first alerted me to the recordings of Maryla Jonas. Robert Yrigoyen of Philadelphia, who kindly provided a discography with reference to his own collection, as well as a transfer from one of his LPs. This discography is copyright © Nigel Nettheim 2001, 2018. Please do not reproduce this discography elsewhere on the Internet; I ask that so that, when I later make corrections, errors in earlier versions will not be propagated. Instead, if you find it of interest, please provide a link to it. If you are interested in reproducing it for publication on paper or in any other way, please contact me first.